Another Monday...Another Sketch Challenge from MJ. I decided to show some more sneak peeks of things in the upcoming Occasions Mini Catalog. I layered the Walk in the Park (in the Occasions Mini) onto Basic Gray, then onto Baja Breeze for my base card. I took another piece of Walk in the Park DSP and cut and layered it onto my Gray card stock to work with MJ's Sketch. Cut my Butterflies from Gray card stock and Walk in the Park DSP, added some pearls from the Pretties Kit, then attached to my panel with dimensionals. The cool shaped panel was cut from Baja Breeze using my Big Shot and the new Matchbox Die (Occasions Mini). 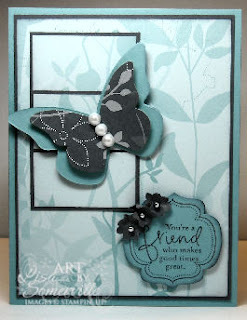 I used my Stamp-a-ma-jig to stamp the sentiment and border from Great Friends (Occasions Mini) in Gray ink, sponged the edges and adhered to my base panel using dimensionals. 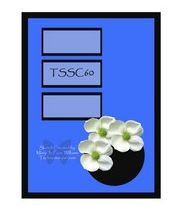 The flowers were created with the Boho Blossom Punch, the n scrunched and adhered to the base card using Glue Dots. Gray Rhinestones were then added to the flower centers. Gorgeous, I love those tiny primas you used. Now that is the way it should look, not sure why I forced that butterfly on my on the circle it looks sill, your on the other hand is perfect. Ahhh to have your talent! Thanks so much for playing along. This is just right, Lisa!!! I struggled with this sketch. I LOVE what you did with it, using the three images on the side as a panel for the butterfly!